Subtraction is a little trickier for our preschoolers than addition. 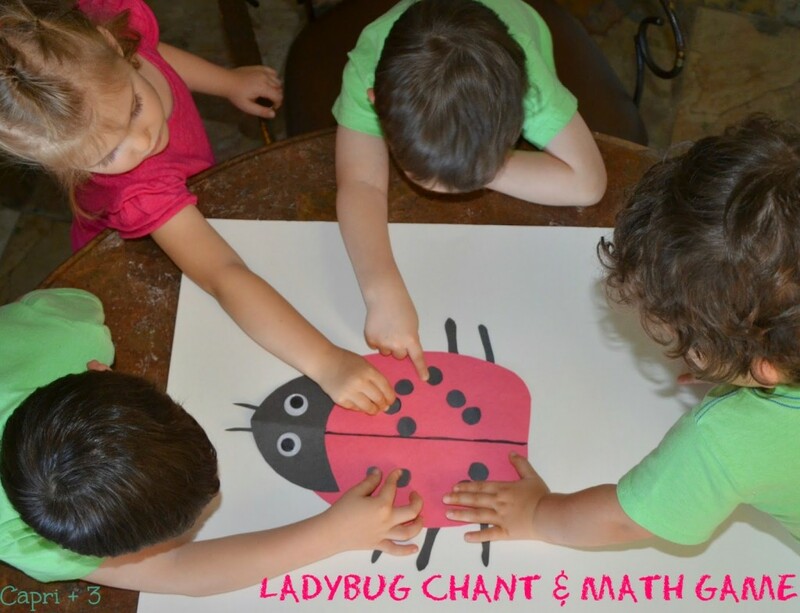 I decided to add an element of fun by creating a Ladybug Chant & Math Game. I made up a chant which you can try with your preschool or kinder children. Our preschoolers had so much fun that they continued to say the chant after the game was over and asked if they could play the game again the next day. Cut out a ladybug shape from the red piece of paper. If you fold it in half, it is easy to eyeball the shape and cut it out. Cut a head shape, six legs and two antennae out of black paper. Then trace something, such a as a glue stick to get a circle shape. Cut out several circles at a time for a total of 10 from black paper. Glue the legs to the back of the ladybug. Glue the antennae to the back of the head. Glue the head onto the body. Glue the google eyes onto the body. Use the dots for the chant. Do not glue the dots. Ladybug, Ladybug, you’ve got spots! How many spots have you got? 1, 2, 3, 4, 5, 6, 7, 8, 9! Just for fun, let’s take away 1! 9 – 1 = 8! Continue this chant until you reach 2 – 1 = 1. Ladybug, Ladybug, you’ve got a spot! Just for fun, let’s take away 1. Ladybug, Ladybug, you’ve got no spots. Just for fun, we’ll give you some. 1, 2, 3, 4, 5, 6, 7, 8, 9, 10! (Have children place spots back on the ladybug). In this picture, they are placing the spots back on the ladybug. Fantastic and I love the chant. 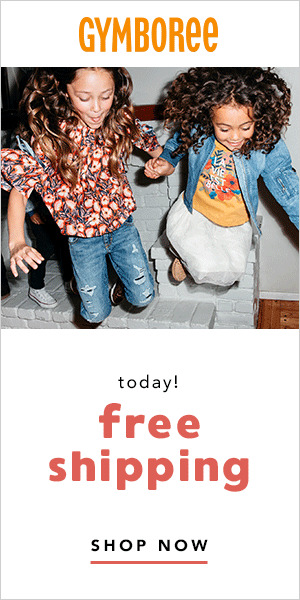 I know what we will be doing this afternoon. I LOVE the chant! 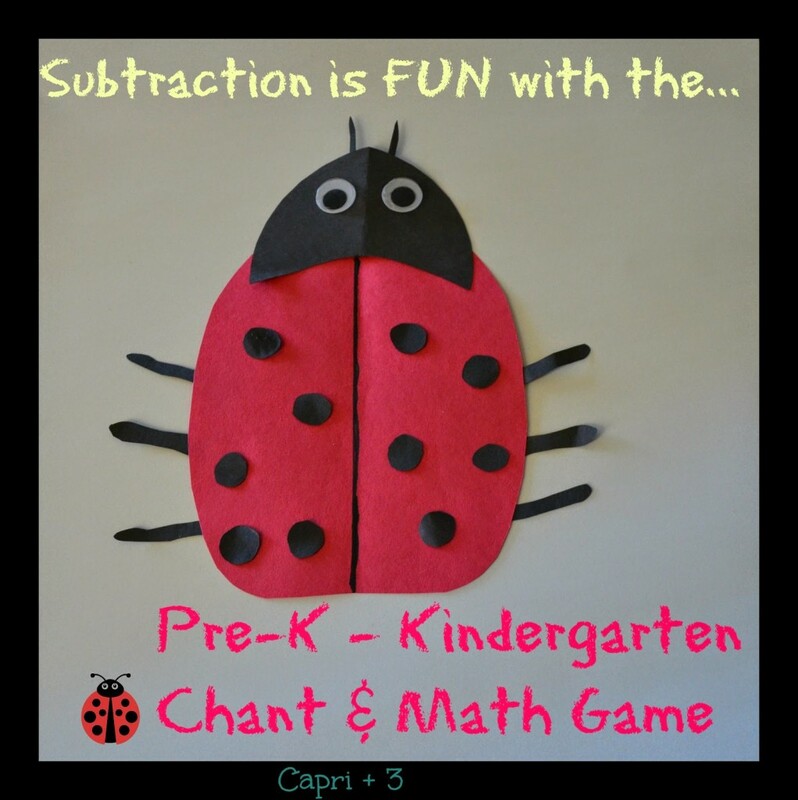 So fun and a great way to work on subtraction! Although I enjoyed math at times because I like solving problems, I think I could've used a game to make it more fun, and I'm sure the babes would love that too when they're older! Thanks for sharing :). I could have used more fun games for math at this age too. It takes the 'work' out of solving problems. I hope you and your daughter have fun with this. Oh I love this! Chanting and singing is such a wonderful way to learn. Can't wait to do this with my kids. Thank you! You could always try this and other activities on a weekend or break time and see how you like it. Thank you Growing Book by Book! I hope you and your kids have fun with this. Love the chamt. Will be singing this.